�?�?�? ?便签软件�?谢谢你们~~ It's an excellent softwear,very convenient, love u guys! Thanx a lot! Great software, great quality. Awesome! Thanks for your efforts. Thanks for providing it for free. Great app. 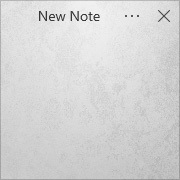 best alternative to windows sticky note.has all features .and for free. Great I like it a lot..
Make it for Linux also, as the post it notes for that OS are poor.